Author: Amos, Eric J.R. Set In . . . 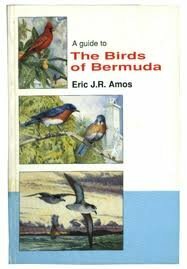 Description: From the rear cover of this 206-page book: "This is the long overdue first complete guide to the birds of Bermuda. And Bermuda -- with the unique Cahow; flamboyant tropicbirds; noisy Great Kiskadees; beautiful bluebirds and cardinals; the European Goldfinch and two species of African waxbills among its 22 nesting species and an average of nearly 200 migratory species each year -- can provide some very exciting avian moments. Indeed, more than 340 species have been recorded on this tiny island and this guide will alert the birder where and when to look to find as many as possible at all times of the year. Apart from the seasonal and monthly information, several all-day or part-day self-guided tours (with maps) will lead the birder to the most rewarding birding spots and a great variety of habitats. The core of this guide is found in the Annotated Species Accounts. Complete with charts that succinctly show the relative abundance of the migrant species over the last twenty-one years, these accounts link all known historical and modern records, and include arrivals and departures, habitat preferences and habits. Over 220 species are illustrated in color and halftone."